American Historic Inns has given away more than 2 million free nights at a bed and breakfast through promotions co-sponsored with consumer goods companies such as MinuteMaid Orange Juice, Diet Coke and Norelco Shavers. This is a Buy-One-Get-One program with vouchers provided online, in pack, on pack or delivered in a booklet. Consumers love this program because it gives them an excuse for an easy getaway at a bed and breakfast and is the very best travel deal out there – spontaneous, inexpensive and there’s likely to be a great inn within a 2 hour drive. Call for quotes and information on how to adapt to your theme whether it be Health & Wellness, Romance, Eco-Friendly, Pets, Family Adventure, the Great Outdoors, etc. The average BOGO certificate saves the consumer $142. 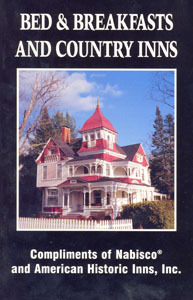 1,300 inns to choose from all over the U.S. and Canada. Anyway, we love using I Love Inns!